You'll be £19.99 closer to your next £10.00 credit when you purchase With Winston Churchill at the Front. What's this? He was already a Major in the Territorial Reserve and he was offered promotion to Lieutenant Colonel and with it command of a battalion on the Western Front. On 5 January 1916, Churchill took up his new post with the 6th (Service) Battalion, Royal Scots Fusiliers. The battalion’s adjutant was Captain Andrew Dewar Gibb who formed a close relationship with Churchill that lasted far beyond their few weeks together in the war. Dewar Gibb subsequently wrote an account of his and Churchill’s time together in the trenches. Packed with amusing anecdotes and fascinating detail, Gibb’s story shows an entirely different side to Churchill’s character from the forceful public figure normally presented to the world. Churchill proved to be a caring and compassionate commander and utterly fearless. Despised on his arrival, by the time he departed he was adored by his men. Supplemented with many of Churchill’s letters, the observations of other officers and additional narrative this is the most unusual and absorbing account of this part of Churchill's life that has ever been told. The book is well illustrated with photos and maps, including some of Winston’s own paintings he made whilst in reserve trenches. Also at the end of the book is a very detailed description of the area covered in the book as it is in current day, with directions by car and on foot to visit the various locations the Battalion was stationed in at Plugstreet. A mini guide book as such. A welcome addition to literature of the First World War and for the study of what made Churchill the man he was. This book is an excellent edited version of the original account, adding further material to support and complete the original work, some of which are from Churchill’s own letters, some others are from soldiers themselves. There are some amusing anecdotes and, together with the additional background information, this gives the reader an insider’s view, not only to a battalion at the front in early 1916, but also into Churchill’s personality whilst a battalion commander. The last chapter is written as a very useful battlefield guide to Churchill’s ‘front’ at Ploegsteert in Belgium should the reader wish to visit. A great book and recommended read for any Churchillian of what must be the most comprehensive narrative of Churchill’s time at the front. This is an excellent reproduction of the original 1924 text with some handy explanations and putting things in to context. This book has always been an excellent addition to the Winston Churchill canon of literature, but in most books about him his time on the front rates a few paragraphs. This book illuminates a much forgotten part of Churchill’s personal history, when after the shambles of the Gallipoli campaign, his political career stalled. Even though out of government he still wanted to fight the Central Powers, and was a major in the territorials, was offered a promotion to Lieutenant Colonel and command of a battalion on the Western Front. In January 1916 he took up command of the 6th Battalion, Royal Scots Fusiliers, and he formed a close relationship with his adjutant Captain Dewar Gibb, which we learn went on far beyond the trenches. Captain Dewar originally wrote under the pseudonym of Captain X, but over the subsequent years we now know who he is and was. Something that Dewar shows that Churchill rather than being the bombastic person we know he could be was a caring and compassionate, military leader who was utterly fearless in the face of the enemy. Something that does come across in this book is how much he was respected and adored by all those that served under him. Gibb’s story is packed with historical detail and some wonderful anecdotes which are absolutely fascinating. Now that story has been supplemented with Churchill’s own letters, and observations of other soldiers, with additional narrative. Those who read this book will be completely absorbed by this account and it yet another view on Churchill that we do not often see. Once again this is a fascinating and absorbing account of a much forgotten period in Churchill’s life, once a soldier always a soldier. An excellent read. A good mix of the original 1924 text and modern explanations and expansions. Expands on what is often covered in only a few paragraphs or at most a page or two in most other books on Churchill. It does mainly cover the 3 month period in which Churchill was CO, 6th Royal Scots Fusiliers but does so in depth. Gives good insight into the type of leader Churchill was and the care he had for his men. Selected for Book of the Week. 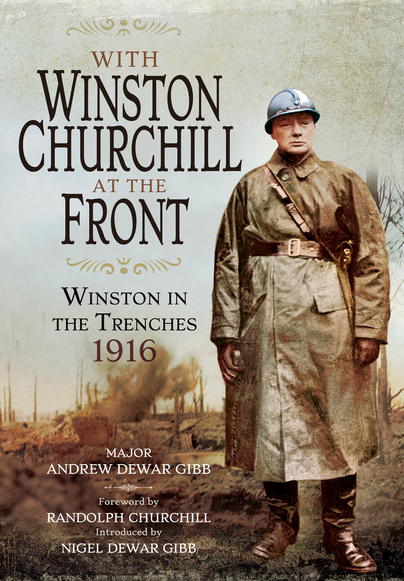 ... A new version of Gibb’s book has recently been published by Frontline Books, 92 years after the first edition, with the somewhat awkward title of With Winston Churchill at the Front, Winston in the Trenches 1916. Although the original text has been “unaltered and uncorrected,” Nigel Dewar Gibb, the son of the author, has enlarged the original volume with a new introduction as well as additional chapters and text. The introduction provides a biographical portrait of his father, with interesting personal touches, such as his father quitting eating out in protest at the high prices charged in restaurants. New text, based mostly on Churchill’s letters and writings, is combined in the book with the original manuscript. The original 1924 text is printed in bold and is interspersed with new text that is printed in lighter weight and indented. In reading the volume, alternating between the two texts is smooth and works well. The younger Gibb has uncovered some nuggets in his research, including that Churchill made a total of 36 “forays” into No-Man’s Land while in command of the battalion. In this new edition, Nigel Dewar Gibb has told a more complete story of Churchill’s experiences with the Royal Scots Fusiliers. The manuscript is supported by several interesting photographs. ...Gibb’s story is packed with historical detail and some wonderful anecdotes which are absolutely fascinating. Now that story has been supplemented with Churchill’s own letters, and observations of other soldiers, with additional narrative. Those who read this book will be completely absorbed by this account and it yet another view on Churchill that we do not often see. in the trenches with Winston Churchill. This is a story about one stage in the life of one of the most important people of the 20th Century. It will of course appeal to all those interested in the land actions of WWI and it will appeal to all those who are interested in politics and politicians. It should appeal to a very wider audience because it is about a truly inspirational and controversial individual who is much larger than life. A great story, told with humour, and a great individual. Most recommended. One normally thinks of Winston Churchill as being involved mainly in the defence of Britain during the Second World War, putting his early military career firmly to one side. Gibb's study of Churchill's involvement on the Western Front reads like a Boys' Own Paper story. Contains material from Churchill's own letters, and provides a comprehensive telling of his story and experiences that saw him emerge from the war a stronger and more popular man with an enormous destiny ahead of him. Brilliant. An interesting book to read and one I found gave a good insight to a period of the career of one of our most famous statesmen, and a part of his story I for one had known nothing about before. Following graduation, Gibb became a member of the Scottish Bar in 1914. During his service with the Royal Scots he reached the rank of Major. After the war he continued with his legal career. Andrew Dewar Gibb was also a founder member and leader of the Scottish National Party. He died in Glasgow on 24 January 1974 aged eighty-five.